Does democracy cause more economic prosperity and growth? This question dates back to Plato and Aristotle’s debate regarding which form of government brings more political and economic gains to society. However, after more than two millennia, there seems to be no clear consensus about whether democracy (in and of itself) does indeed deliver more economic growth than other more autocratic forms of governments. Answering this important question has become a task of an empirical nature. On the one hand, research that relies on cross-country comparisons has questioned the relevance of democracy to economic growth (Sirowy and Inkeles 1990, Przeworski and Limongi 1993, Helliwell 1994, Barro 1996, Tavares and Wacziarg 2001). On the other hand, more recent economic studies that rely on panel data actually tend to support the theory that democracy has a sizable effect on economic growth (Rodrik and Wacziarg 2005, Papaioannuo and Siourounis 2008, Persson and Tabellini 2009, Acemoglu et al. 2014). 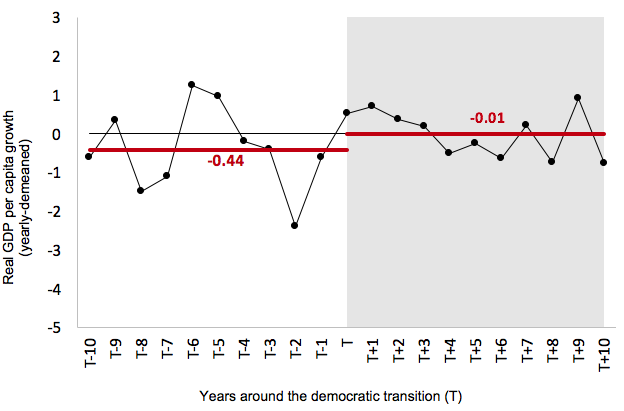 Indeed, Figure 1 depicts this empirical regularity for 38 democratic transitions during the so-called ‘Third Wave’ of democratisation and the democratisation that followed the fall of communism in the early 1990s.1 The average annual per capita growth rate increases about half a percentage point following a democratic transition. 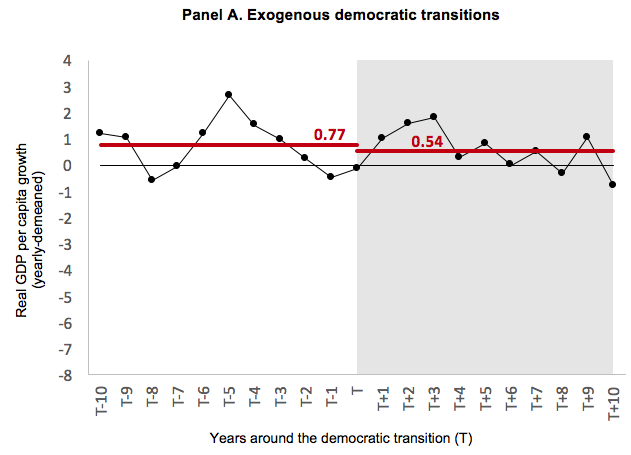 Depicted by red lines, growth after the democratisation is statistically larger than before the transition (-0.01% versus -0.44%, respectively). While small at first glance, the compounding effect of this difference would reduce the time needed for this group of countries to converge towards OECD income levels by one third. The evidence portrayed in Figure 1 seems to show that, taken at face value, democracy has a sizable impact on economic growth. Notes: The figure plots the evolution of yearly-demeaned (country growth rate minus the average growth rate for that year) average real GDP per capita growth in the 10 years before (non-shaded area) and 10 years after (shaded area) a democratic transition. Red lines depict average growth rate before and after democratisation (such difference in means is statistically significant at the 5% level). Despite this evidence, however, extensive political science research indicates that endogeneity (i.e. reverse causality) considerations may be at work here, and that economic turmoil is responsible for causing or facilitating many democratic transitions (O'Donnell 1973, Linz 1978, Cavarozzi 1992, Remmer 1993, Gasiorowski 1995, Haggard and Kaufmann 1995). Under this view, the lower (and negative!) growth rate depicted in Figure 1 before the democratic transition may indicate that poor economic performance pushed or catalysed the end of autocratic regimes. For example, many scholars point to the oil shocks of the 1970s, the related expansion of international lending, and the subsequent debt crises as the origin of the wave of democratisation in Latin America in the 1980s. In other words, the positive association between democracy and economic growth portrayed by Figure 1 could reflect that democracy causes more economic growth (the argument pushed by recent economic studies) or that economic turmoil causes the emergence of democratic rule (the argument espoused by extensive political science research) or, to some extent, both. Although disentangling this causality is not an easy task, understanding the true impact of democracy on economic growth remains crucial. Figure 2 recreates Figure 1 by dividing countries into exogenous (Panel A) and endogenous democratisations (Panel B). Notes: The figures plot the evolution of yearly-demeaned (country growth rate minus the average growth rate for that year) average real GDP per capita growth in the 10 years before (non-shaded area) and 10 years after (shaded area) a democratic transition. 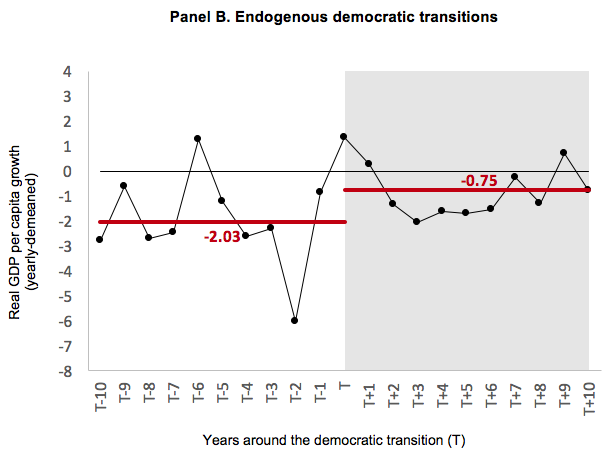 Panels A and B plot these figures for exogenous and endogenous democratic transitions, respectively. Red lines depict average growth rate before and after democratisation (such difference in means is not statistically significant in Panel A and statistically significant in Panel B at the 5% level). The evidence from Figure 2 shows that democracy does not cause growth. Panel A shows that ‘exogenous democratisations’ (i.e. democratisations that are not contaminated by endogeneity concerns) have no effect on economic growth. Depicted by red lines, growth rates before and after democracy are statistically the same. As a corollary, Panel B shows that the effects of democracy on economic growth are driven by ‘endogenous democratisations’. In other words, the common positive association between democracy and economic growth is driven by the wrongful inclusion of endogenous democratic transitions to estimate the impact of the political system on economic performance (which, in turn, gives the false impression that democracy causes more growth). In summary, we show that a further examination into genuine endogeneity considerations indicates that, contrary to recent findings, democracy unfortunately does not seem to be the key to unlocking economic growth. Of course, this cautionary reality applies in reverse, too. While democracy does not seem to be the key to unlocking economic growth, it would be a mistake to conclude that an autocratic or dictatorial regime would fare any better. In other words, the form of government has little bearing on economic prosperity. Acemoglu, D, S Naidu, P Restrepo and J A Robinson (2014) “Democracy does cause growth,” NBER Working Paper No. 20004. Barro, R J (1996) “Determinants of economic growth: A cross-country empirical study,” NBER Working Paper No. 5698. Cavarozzi, M (1992) “Beyond transitions to democracy in Latin America”, Journal Latin American Studies 24: 665-684. Gasiorowski, M J (1995) “Economic crisis and political regime change: An event history analysis”, The American Political Science Review 89: 882-897. Haggard, S and R R Kaufman (1995) The political economy of democratic transitions, Princeton University Press. Helliwell, J F (1994) “Empirical linkages between democracy and economic growth”, NBER Working Paper No. 4066. Linz, J (1978) The breakdown of democratic regimes: Crisis breakdown, & reequilibration, The John Hopkins University Press, Baltimore, MD. O’Donnell, G (1973) Modernization and bureaucratic authoritarianism: Studies in South American politics, Institute of International Studies, California. Papaioannou, E and G Siourounis (2008) “Democratisation and growth”, The Economic Journal 118: 1520-1551. Persson, T and G Tabellini (2009) “Democratic capital: The nexus of political and economic change”, American Economic Journal: Macroeconomics 1: 88-126. Przeworski, A and F L Przeworski (1993) “Political regimes and economic growth”, The Journal of Economic Perspectives, 7: 51-69. Remmer, K L (1993) “The process of democratization in Latin America”, Studies In Comparative International Development, 27: 3-24. Rodrik, D and R Wacziarg (2005) “Do democratic transitions produce bad economic outcomes?”, American Economic Review, 95: 50-55. Ruiz Pozuelo, J, A Slipowitz and G Vuletin (2016) “Democracy does not cause growth: The importance of endogeneity argument”, IDB Working Paper Series Nº IDB-WP-694, Inter-American Development Bank. Sirowy, L and A Inkeles (1990) “The effects of democracy on economic growth and inequality: A review”, Studies In Comparative International Development, 25: 126-157. Tavares, J and R Wacziarg (2001) “How democracy affects growth”, European Economic Review, 45: 1341-1378. The list of 38 democratisations include Argentina, Benin, Bolivia, Brazil, Bulgaria, Cape Verde, Chile, Croatia, Czech Republic, Dominican Republic, Ecuador, El Salvador, Estonia, Ghana, Greece, Grenada, Guyana, Honduras, Hungary, Republic of Korea, Latvia, Lithuania, Mali, Mexico, Mongolia, Panama, Peru, Philippines, Poland, Portugal, Romania, Sao Tome and Principe, Senegal, Slovak Republic, Slovenia, South Africa, Spain, and Uruguay. For more on the methodology, see our paper here.